This present disc is an admirable example of 'the best of both worlds' - and I couldn't refrain from whistling along with almost every item! It has serious thought, but its Mozartean elegance in all but two of the examples here, is infectious, with a gentle humour that, far from belittling the category of 'light' music, is a strong advocate for the genre. Generalisations are apt to be argued against - and there are exceptions here too - but the convincing, committed advocacy of the soloist John Turner (whose huge enthusiasm has drawn delightful music from all sorts of composers) and his truly virtuoso playing, makes this showcase disc a delight to listen to. The opening 'Suite Ancienne' of Philip Lane is an excellent example of that 'best of both worlds', echoing a gracious age, yet its artifice coloured by a very English restraint in the pastoral harmony of the strings (with a captivating echo in the Minuet of 'The Last of the Summer Wine'!) At the same time the sometimes cartoon-like character of the descant recorder suggesting whatever revelry is entailed in Beau Brummel's bath night is quite delightful. 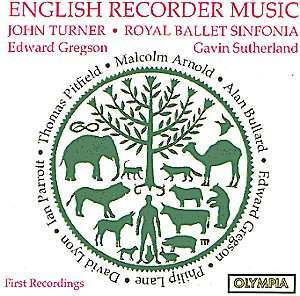 Paradoxically the ebullient Malcolm Arnold is represented by a darker, more serious Concertino (arranged by Philip Lane for this recording) - serious at least until the effervescent Rondo finale with its perky tunes. The recent death of Tom Pitfield robs both art and music (not to mention the recondite art of the Limerick) and listening again to his Concerto the sense of design, born of his artistry (which adorns the sleeve design) is strong. The Beethovenian opening, perhaps intentionally trying to be slightly pompous, contrasts with the beautifully limpid melodic 2nd subject (a shade of Couperin singing the Easter Hymn?) After the second movement's lovely 7/8 tune, exploiting to the full the lovely 'lieblich gedakt' woody sound of the tenor recorder, the final Tarantella is perhaps a trifle too long for balance - any self-respecting spider would have dispatched its victim more speedily! The colourful world of Matisse is matched in Edward Gregson's quasi-impressionistic orchestral version (difficult to imagine in the original piano and recorder version) - the luxurious second movement a kind of L'apres midi, but with a more introspective faun. This set of 'Matisse Impressions' uses the recorder less as a soloist than as a concertante element in the overall tapestry of fauviste colour. David Lyon's Concertino, written for the soloist, again for me evokes almost visual images - its opening friendly piece of banter in 'Badinage' followed by a central Reverie (Paris in the Spring?) shades of Satie - and concludes with a Promenade born, believe it or not, from a TV jingle - tho' one of some elegance? Tom Pitfield's second offering is a cheeky pot-pourri of well known sea-songs and shanties whose second movement's spectral Tom Bowling, already 'gone aloft' appears to the ship's company, who in the finale The Keel Reel (surely self-explanatory?) has the little midshipmites cavorting with some abandon. The opening gestures of Ian Parrott's Prelude and Waltz bring us dramatically back to a more serious vein, which the energetic waltz rhythm (its melody born of a dream experience of his wife) does little to dispel. Here the cadenza for the soloist is played with verve before the return of the opening admonitory figure. - probably the most powerful work on the disc. Alan Bullard's final 'collation' (by no means a 'cauld' one) enters the genteel Albert SandIer world of the cafe -but with the more exotic overtones of 'blues', Spanish dances, and mornings on the Yellow River. The disc ends in a tussle between Rossini and Shostakovitch in a delightfully vulgar delicacy of a dish of Fish and Chips, which however defeats my whistling ability.